The 142nd running of the $2 million Kentucky Derby (G1) Presented by Yum! 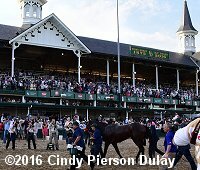 Brands was contested on a near-perfect Saturday afternoon at historic Churchill Downs in Louisville, with sunny skies and temperatures in the low 80's for the 167,227 paying spectators in attendance, the second largest in history (the record was set last year). A brief period of rainshowers fell about 90 minutes before post time for the Derby, but the track remained fast. With no scratches, the originally drawn field of 20 all went to the starting gate. As expected, 2015 Eclipse Award champion 2-Year-Old Male Nyquist was bet down to 2-1 favoritism, still unbeaten in seven starts including last year's Breeders' Cup Juvenile at Keeneland followed by the San Vicente (G2) and the Florida Derby (G1). In to challenge him included 5-1 second choice Exaggerator, winner of the Santa Anita Derby (G1) after finishing third in the San Felipe (G2) both at Santa Anita, and 10-1 third choice Gun Runner, winner of the Risen Star (G2) and Louisiana Derby (G1) both at Fair Grounds. Nyquist leads on the outside down the stretch. When the gate opened at 6:51pm, jockey Mike Smith sent 25-1 Danzing Candy, out of post 20, all the way to the lead and down onto the rail through an opening quarter mile in 22.58, while Nyquist settled just to his outside in second, in turn 1/2 a length ahead of Gun Runner third. Danzing Candy set fractions of 45.72 and 1:10.40 before tiring on the far turn, allowing Gun Runner to gain a short lead at the top of the lane through 1 mile in 1:35.61. However, Nyquist, 3 wide throughout under confident handling by Mario Gutierrez, still had plenty left. He drove on by Gun Runner at the 3/16 pole and opened up a 2 1/2 length lead midstretch. Exaggerator, 15th early under Kent Desormeaux, came through traffic and put in a strong late rally but was left with too much ground to recover as Nyquist finished 1 1/4 lengths in front in 2:01.31. It was 3 1/4 lengths back to Gun Runner third, and a head back to late-running 11-1 Mohaymen fourth. It is worth noting that the first four horses finished in order of their win odds! 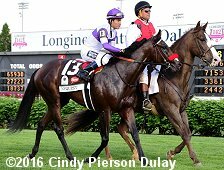 Left: Nyquist comes back on the turf course heading to the winner's circle. Trainer Doug O'Neill said, "It's unbelievable. Got to thank Paul and Zillah for this opportunity. Like Paul said, he knows the O'Neill language. I know the Elias language, his groom. And the Johnny Garcia language, his exercise rider. And those guys, they are the unsung heros. Because they do all the work, and they are there long hours. And I could tell in the last week or so, Elias he is very serious about his trade and loves his horses so much. He has been smiling more than I have ever seen him smile. I didn't know what was going on. Now I think we all know." 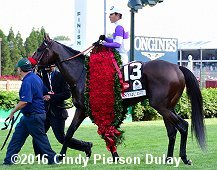 Right: Nyquist parades with the garland of roses. Jockey Mario Gutierrez said, "Like I say, it's a lot of nerves. But I do believe that I have matured as a rider. And I'm doing things I wasn't doing four years ago. So that makes me have a lot of confidence. I know that my surroundings always believe in me, so you get extra confidence. And Mr.�Reddam, my wife, the whole team, Johnny, the groom Elias. I believe I got the right people behind me, so they always give me confidence. That's where I get my strength and confidence." Left: Nyquist heads back to the barn. Gutierrez said, "The trip was amazing. We got a beautiful trip, you know, from the start to the end. And the pressure, it is pressure. Like the horses on the field, it's the Kentucky Derby. It's the only race we have, like, 19 other horses trying to get to the wire first. But, like I say, I get the confidence from Nyquist. I was able to work him since he got to the track, so I know him a lot, and I trust him. And I believe he trusts me as well." 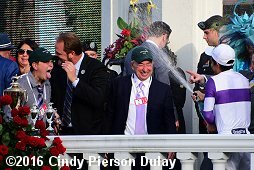 Right: Gutierrez holds up the Kentucky Derby trophy with trainer Doug O'Neill (left) and owner Paul Reddam (right). Reddam said, "I feel really good for the horse. Because along the way the last year, he has taken a lot of shots for whatever reason. And I think he proved all his critics wrong today. So I'm really proud of him and the whole O'Neill team and Mario's ride. It was just flawless from beginning to end." Left: The trophy presentation with jockey Mario Gutierrez spraying trainer owner Paul Reddam and trainer Doug O'Neill with champagne. Reddam added, "The horse is named after Gustav Nyquist. He plays for the (Detroit) Red Wings. I have been a life-long Red Wing fan. And partners in a couple horses with Erik Johnson who plays for the Colorado Avalanche. I was telling Erik last year, "Geez, when you are a free agent, you should sign with the Wings. He said, "I'll never sign with them. Are you kidding?" So just to get at him, I named a couple of horses after Red Wings. And Nyquist was one of them.� Then he was, "Can I buy a piece of Nyquist? "� I was like, no." 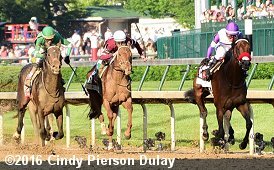 Right: Soon after the start of the 142nd Kentucky Derby with eventual third place finisher Gun Runner on the rail, pacesetter Danzing Candy on the outside (yellow cap), and eventual winner Nyquist in the center (purple cap, red nose band). Mike Smith aboard Danzing Candy said, "One thing I found out today that we didn't know about, I never heard him breathe the way he did today. It sounds like he�flipped his palate. As loud as that crowd was, I could hear him down the lane. When I pulled him up, he sounded like a lion." 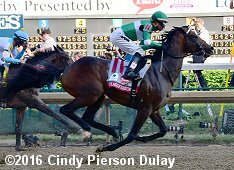 Left: Second place finisher Exaggerator first time by, in 15th place 17 1/2 lengths off the pace under Kent Desormeaux. Desormeaux said, �My horse slammed on the brakes at the 3 1/2, ducked back to the inside and then took off. When you see the replay, it will be obvious. Before the race, my brother (trainer Keith) was really calm, calmer than any trainer I have ever ridden for. He just told me to have fun out there.� Keith added, �I thought we had time to catch Nyquist. He had clear running room the entire 1/4 mile stretch. I thought for sure we would catch him. He did kind of level off the last 1/16 mile. Maybe he ran out of the training. 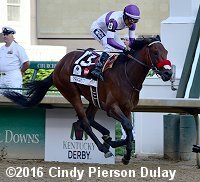 I didn�t see where Nyquist was during the race until after it was over and he was right there on the pace." 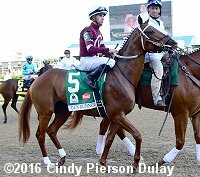 Right: Third place finisher Gun Runner in the post parade. 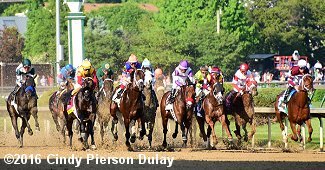 Trainer Steve Asmussen said, "We tried to win. A solid pace. Nyquist was the horse to beat. I thought Florent (Geroux) tried to win the race. I loved where Gun Runner was. I was worried about him going too fast, but you can see that he was relaxed. He's talented." Geroux added, "When I hit the top of the stretch, the horse was just coasting along. He broke very nice, clear. I thought I had it for a minute. He started pricking his ears back and forth at the top of the stretch."